Gate of Athena Archegetis, Roman Agora. From around 500 BC Athens became an important city-state, as well as a prominent centre for the arts and philosophy. From this time until the 4th century AD many wonderful and some colossal buildings were erected in the city. Many of these can be visited today: from Plato’s Akademia and Aristotle’s Lyceum to the astounding ruins of the Temple of Zeus completed by Hadrian. 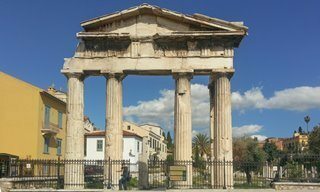 This self-guided tour of Ancient Athens includes the more important attractions, most of which are clustered around the Acropolis and within easy walking distance of each other. 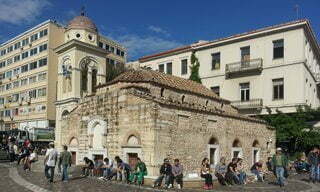 10th Century basilica, Monastiraki Square. Following the shift in power from Rome to Constantinople in the 3rd century AD, Athens was sacked from time to time but remained in Imperial hands as a provincial town up until the beginning of the 13th century. Many of the better known Byzantine churches in Athens and surrounding areas were built during the 11th and 12th centuries, a period thought to be Athens’ Golden Age of Byzantine art. During this self-guided tour you will get to see some of the oldest churches in the city, as well as extraordinary Byzantine objects in some of Athens’ finest museums. In situ remains at Monastiraki Metro Station. The construction of the metro network in Athens between 1993 and 2000 facilitated the largest ever programme of archaeological excavation in Greece. Over an area of 79,000m2 archaeologists recovered more than 50,000 artefacts. The presence of the archaeology was not a surprise to anyone, in fact it was predicted. And designers of the metro stations incorporated display space into their plans from the outset. Today eight stations have informative exhibits of the artefacts found. The stations are (light blue markers on the map): Panepistimio, Syntagma, Akropoli, Evangelismos, Monastiraki, Dafni, Elaionas and Aigaleo. Entrance to the Acropolis Museum. 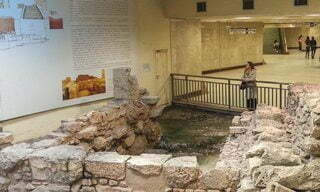 Perhaps because of the well known archaeological sites in Athens, the city is not considered one of the museum capitals of Europe. 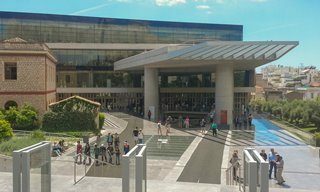 The new Acropolis Museum has a high international profile, not just for the collections housed within it but also because of its award-winning architecture. In all, spread over the greater Athens area, there are over 70 museums (indicated with dark blue pins on the map) for visitors. Besides the expected archaeology and history museums, there are also museums of art and design, science and nature, ethnography and folklore, gastronomy, fashion and music. For a great view of the Acropolis from a distance (perfect for a selfie, well … we have all done it), particularly at sunset, Vrahakia (Greek for little rocks) is a short climb up Areopagus Hill. If you hotel does not have a roof-top bar/restaurant, find one! An evening meal, or even a cocktail as the sun goes down is quite a magical experience at a good location. 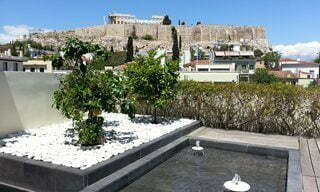 For a great view of the Acropolis, I recommend staying and/or eating at the Herodion Hotel. Athens is certainly not all ruins and museums. The markets and speciality food shops are a must for anyone with a passing interest in local cuisine and gastronomy. 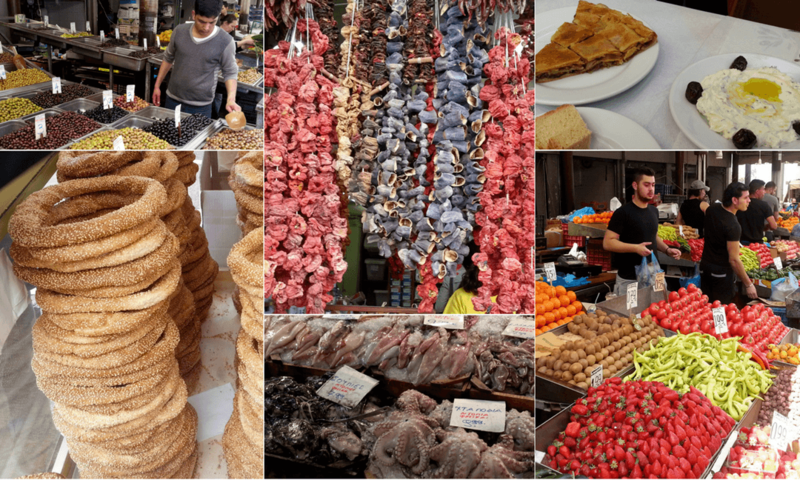 For an introduction to the Mediterranean diet and the best markets in Athens join a 3 Hour Walking Food Tour, or go one better and take a 3 Hour Cooking Class. Gastronomic delights of Athens, sample and buy fresh olives, learn about dried foods, try a koulouri, learn how to prepare Greek favourites, fresh fruit and vegetables, and an amazing array of fresh fish and seafood – enough to make you want to go self catering. And of course, there are day trips from Athens … lots of them … but consider these five to begin with. The Propylaia: entrance to the Acropolis. 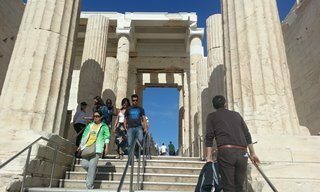 For the Acropolis and six other ancient sites and associated museums in Athens there is a special package ticket that makes it cheaper to visit these popular attractions. These tickets can not be purchased online; rather they are on sale at the ticket offices of the participating sites. For more information about this special ticket, where to buy it, which of the many sites and museums in Athens are included, read the detailed post about the Acropolis and Ancient sites multi-ticket. Sublime roof-top view of the Acropolis. If a meal or cocktails at sundown within view of the Acropolis is a special treat, I recommend the 4* Herodion Hotel. The view on to the Acropolis from the rooftop restaurant and bedrooms on the northern side of the hotel is surely any archaeology traveller’s dream! After a day walking the streets of this ancient city and dozing off with the Parthenon in sight is quite magical. The hotel is a stone’s throw from the Acropolis Museum and within easy, walking distance of all the best sites and museums in central Athens, and the metro for those that are further away. ISLAND HOPPERS: As of 1 February 2018 it is possible to get a direct train between the port of Piraeus to the airport. No longer any need to change trains in Athens. Leaving every hour, the journey takes about 63 minutes, and costs €10 for a single journey. The first departure from Piraeus is 4:44 am, with the last at 20:44 pm. The first departure from the airport is at 5:52 am, the last at 22:50 pm.